I mentioned a couple of days ago that sweet potatoes are not my favorite thing to eat. Well, this stew almost changed that for me. This stew was spectacular. 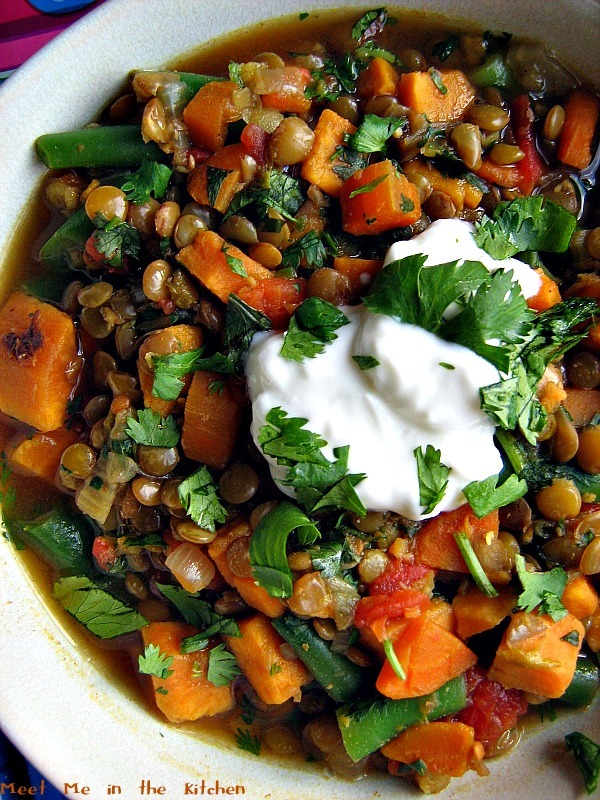 It really is a simple recipe, but the lentils and veggies just really taste so good together. My 4 year old was really excited to eat this and gave 2 thumbs up for this one. It fits this time of year and tastes great re-warmed the next day. About a month ago, I was making some desserts for a luncheon and decided it would be the perfect time to make these S'mores Whoopie Pies that I had spotted a few months ago. 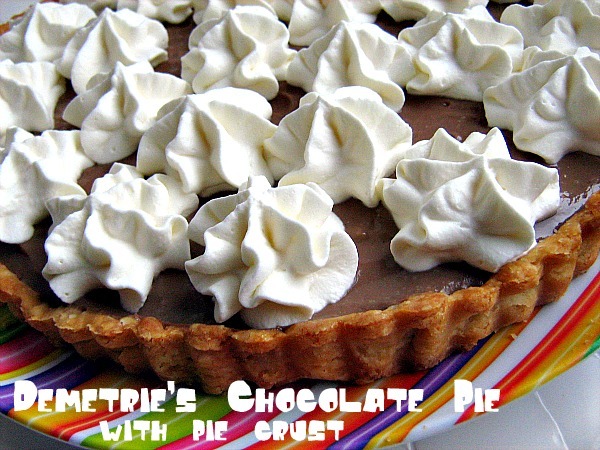 I always hesitate to make dessert recipes that yield so much unless I am sure that I have a way to share them. 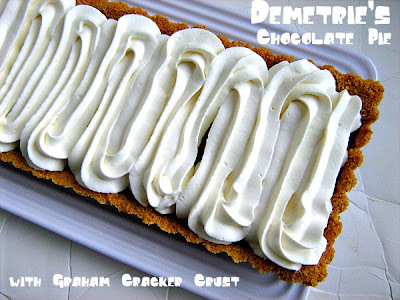 I was excited about this particular recipe because it uses graham flavor in the cookie/cake part of the s'more, which I think adds a really nice flavor. These are a little bit labor intensive, because there are 3 different components- the graham cake/cookie, the marshmallow frosting, and the chocolate ganache filling- but, they were worth every minute. I made these late at night and that is why there is such a horrible light in the picture. 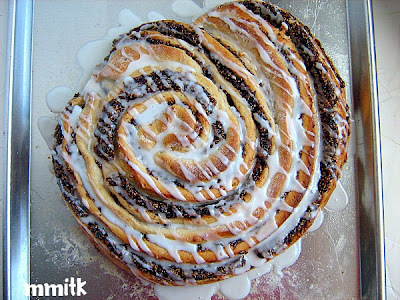 I saved one for the kids to try after they got home from school and we cut it into 5 pieces so everyone could taste it. The consensus was that these were very delicious! The tray returned from the luncheon empty, so I am assuming that the people who ate them felt the same way. 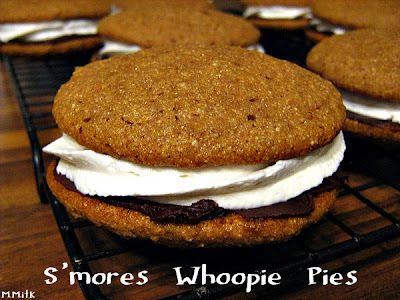 A really fun take on S'mores! Macaroni and cheese doesn't ever happen at our house. Mostly because my son doesn't like cheese and it's kind of hard to hide the cheese in mac n' cheese. Plus, I don't think I ever ate it growing up, so it really isn't something that I think about very often. I came across this recipe and remembered seeing things like this before, where cauliflower puree is used in the sauce and replaces almost all of the milk/cream/cheese, or whatever people usually use in their mac n' cheese. I had 2 heads of cauliflower in my fridge and decided I would try this one out. I used whole wheat shells for the pasta because I couldn't find whole wheat elbows. You cook the cauliflower in boiling water and then the pasta. 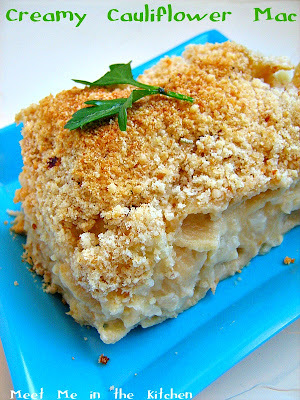 The cauliflower is pureed with a little bit of cheese and some other ingredients that add flavor, like dijon mustard. I added more cheese than called for because I tasted the sauce and it was a little bland, so I added more cheese and tasted it again. My family liked this recipe. My daughter whose favorite food is cheese, absolutely loved it. 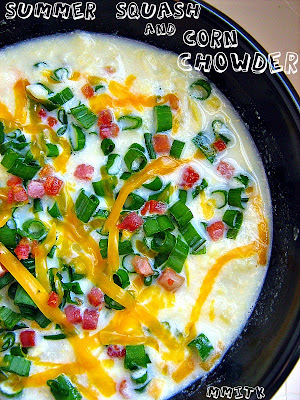 I thought it was really good and a nice way to use cauliflower. I have been looking for new ways to enjoy sweet potatoes since we have received so many in our produce co-op. Sweet potatoes aren't something that I really love, so I was looking for creative ways to eat them, that didn't included making them sweeter (like some dishes do around the holidays with marshmallows and brown sugar). I found a couple of really great recipes and this was one of the first ones I wanted to try out. of it over the years. I wasn't sure how adding sweet potatoes to chickpeas and tahini would taste, but it turned out that this Sweet Potato Hummus was really delicious. It did have a sweeter aftertaste than usual hummus, but it was a really nice variation that we enjoyed. 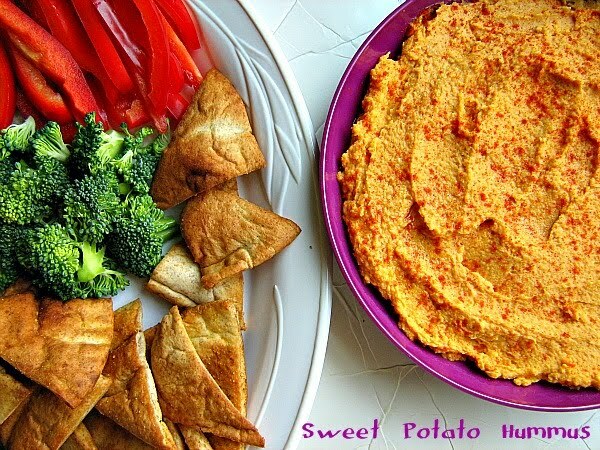 I made some whole wheat pita chips in the oven and we also used fresh veggies as dippers. 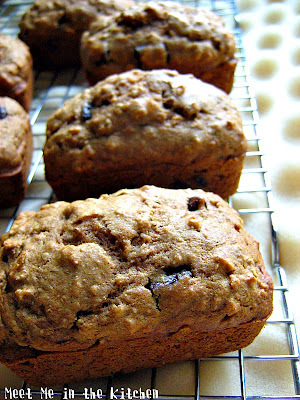 When I saw this Chocolate Chunk Oatmeal Cookie Bread recently, I thought it would make a great after school snack. I decided to make mini loaves because they bake up a little bit faster and also because then everyone can have their own little loaf- no fighting over the end pieces or the one with the most chocolate. My kids absolutely loved these. I would say that it tastes more like a muffin than a cookie, but it really didn't matter. I liked this bread because it wasn't overly sweet and it felt like a healthier option than a cookie. My son declared that this was the best snack ever. That means it will reappear sometime in the near future. I also made these from the same blog, on a Sunday afternoon when we all wanted a treat and have no photo as proof because we gobbled them up quickly. It has cooled down a little bit around here the past week or so, and that means it is okay for me to make soup and/or stew more often. My husband doesn't really enjoy either of these, but he really doesn't like them in the heat of summer. Now that it is September, it is officially soup/stew season. Even though it will probably warm back up soon. (Fine with me!) The calendar says September and Fall, so soup and stews are on the menu. As soon as I saw this stew in Everyday Food Magazine, I knew I would make it. It is easy. It is quick. And it is full of veggies. I loved this even though it was so simple. It had great flavor and my family really liked it too. In a large, heavy pot, heat oil over medium. Add carrots, celery and onion; season with salt and pepper. Cook, stirring occasionally, until carrots soften, about 5 minutes. Add tomato paste and cook, stirring, 30 seconds. 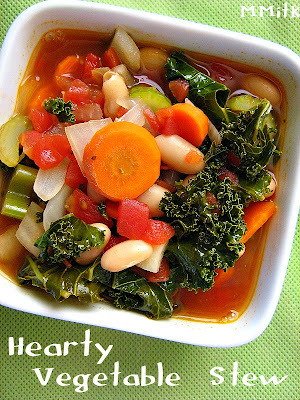 Add tomatoes, kale, beans, thyme and 2 cups water; bring to a boil. Reduce to a rapid simmer and cook until slightly reduced, 15 minutes. I wanted to do something different with the last batch of summer corn that we had a couple of weeks ago and I remembered this chowder recipe from Cooking Light Magazine. I decided to give it a try, even thought I don't really like creamy based soups or chowders- I prefer broth based soups/stews. But, I'm always up for giving things, especially foods, another chance. We ate this, but it definitely wasn't a favorite. I share it simply because I know that not everyone has the same taste buds as we do, so maybe somebody out there will give it a try and love it. It has lots of really good reviews, so there are lots of people out there who liked it more than we did. This recipe popped up on facebook the other day and I figured it would be a good meal for dinner on a Monday night. I happened to have everything on hand that I needed for the recipe and that made it a lot less stressful to get dinner on the table. My dad loves a good BLT sandwich and he grows tomatoes in his garden, so BLT's were always a lunch staple of his in the summer. I personally didn't really like bacon or mayo (I still don't) back then, so I always just watched my dad put these sandwiches together and remember hearing about how good they were. This salad is really good and the interesting thing is that it really tastes like a BLT. Somehow, the combination of the ingredients, makes you feel like you are eating a sandwich. I know that is crazy, but it's true. In this salad, the lettuce has been switched out to lemon, which adds a brightness to the salad, in color and flavor. I added black beans for fun and roasted some broccoli in the oven to round out our dinner. That same night we still had lots of lemons and the kids wanted me to make a quick cookie. I found this one on myrecipes and decided it would be easy to throw them together at the last minute. My kids really liked these. 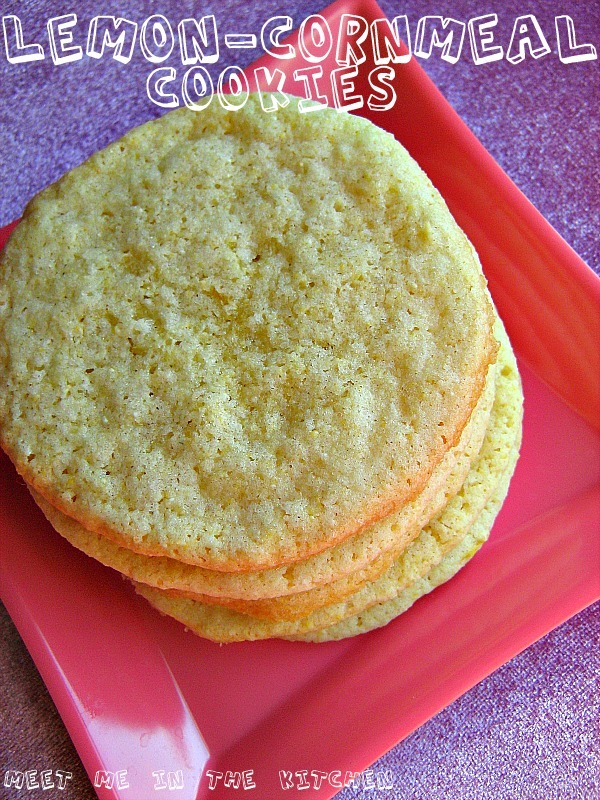 They reminded us of these Cornmeal Lime Cookies in taste and texture. Every once in a while I will watch a cooking show and one of my children with beg me to make the dishes that are being showcased. Or, one of them will say, "I bet you can't make that!" I don't remember if this meal fell into either of those categories, but I do remember seeing this meal being made and really wanting to try the cake that went along with it. I didn't end up making the cake (mostly because we don't eat dessert every day, so I don't let myself bake everyday), but the rest of the meal came together quickly. I used some chicken that I had poached myself a few days earlier and also used celery and peas, since I was out of carrots. 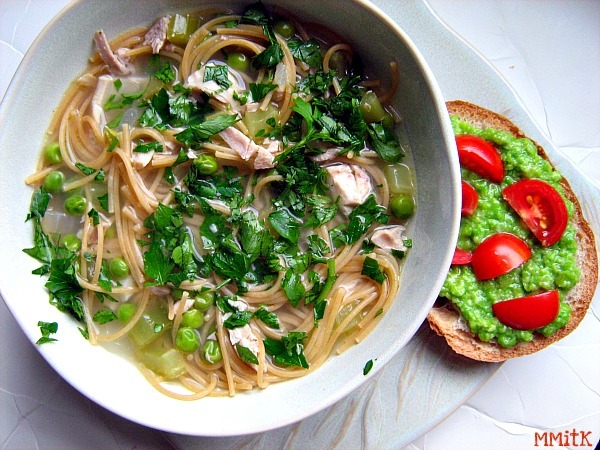 I used whole wheat thin spaghetti for the noodles and my kids really liked this dinner. Nothing too spectacular, but an easy, quick meal that was simple enough to prepare using things that I had on hand. The swiss chard in my garden is still doing really well and I wanted to make something really delicious with the bunch I picked recently. 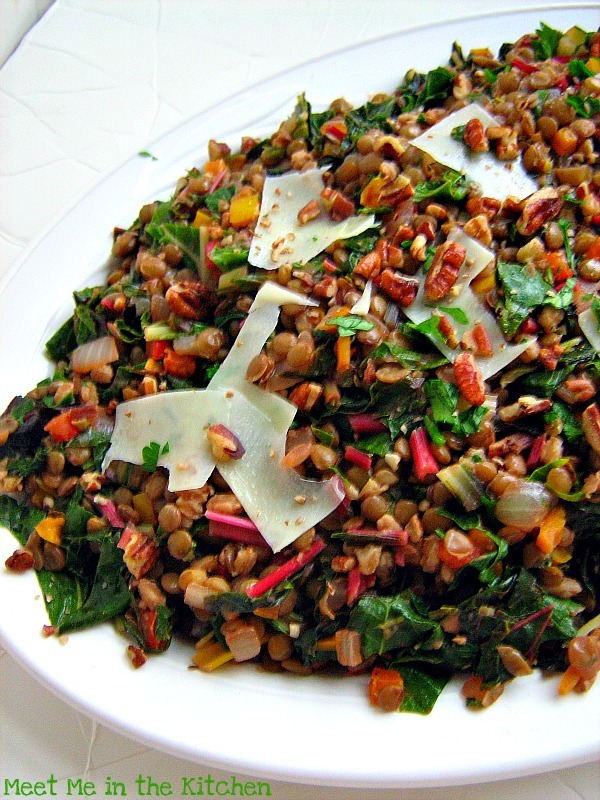 I wanted to use lentils and found a beautiful picture of a dish that combined the 2 ingredients I had been thinking about. I served this on the same night that we had the Panko Crusted Salmon. I think that salmon and lentils really compliment each other and these 2 dishes definitely made for a great dinner. We also had a fennel/celery salad. If you can't find Pomegranate Molasses anywhere or it is too expensive, don't forget that you can make it yourself- Here is the post when I first made it a couple of years ago. My husband came home from work the other night with wild caught salmon from Alaska. He explained that one of his patients had gone on a fishing trip and decided to share the catch. He handed me a bag that contained vacuum packed servings of the beautiful salmon and I tried to keep from jumping up and down with excitement. Salmon can get a little bit pricey sometimes, so I was more than grateful for this lovely gift. I have been wanting to try this particular recipe for quite a while, but salmon has been too expensive. 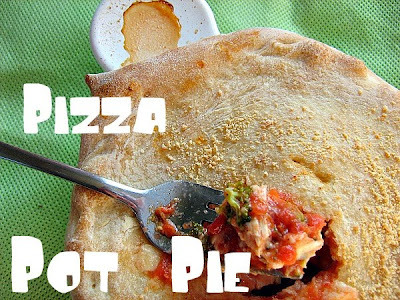 This recipe is so easy, but so delicious. A few ingredients really gave this salmon great flavor. You mix panko crumbs, lemon zest, fresh parsley, and a little salt and pepper and then brush the salmon with dijon mustard. The panko mixture is pressed onto the salmon and it is cooked for a few minutes in a little bit of hot oil. The salmon is than transferred to the oven where finishes cooking to perfection. 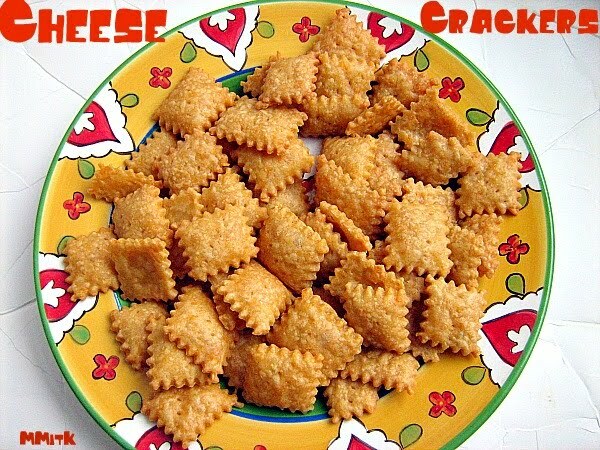 My entire family loved this dish. It was soo good. 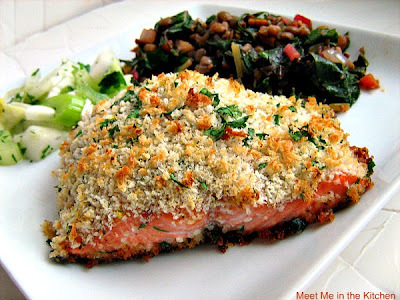 Panko Crusted Salmon from The Barefoot Contessa's How East Is That? Heat the remaining olive oil over medium-high heat in a 12-inch oven-safe skillet. When the oil is hot, add the salmon fillets, skin side down, and sear for 3-4 minutes without turning to brown the skin. I'm guessing that a large number of people out there have read The Help. And maybe you have also seen the movie. My sister bought me a copy of the book over a year ago and I read it from front to back in a little less than 6 hours. It was a great read and a very enjoyable book. Our local Book Club recently discussed this book and I was hosting, so I was in charge of the refreshments. I am not a Southerner and I don't claim to know how to cook like one, but I chose recipes that were "traditional" Southern recipes and used them to help with our evening. I tried to choose food that had at least been mentioned in the book and most of these were also shown in the movie. Chocolate Pie was an absolute must. I found a recipe from the author online and used that. It was one that her maid, Demetrie used to make for her. The recipe stated that you could use a graham cracker crust or a pie crust, so I made both. I used Dorie's recipe for the pie crust because it is the easiest and best one I have ever made. This filling reminded me of a mild chocolate pudding. I topped both of them with sweetened whipped cream. 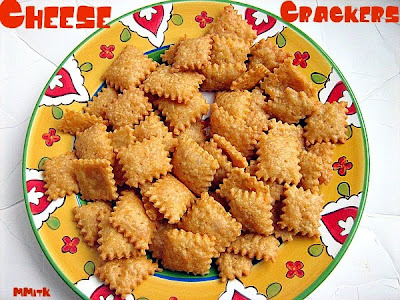 These cheese crackers are originally from the Lee Brothers and I have made them before, but in a different shape. A basic chicken salad that I served in little phyllo cups and also with crackers. 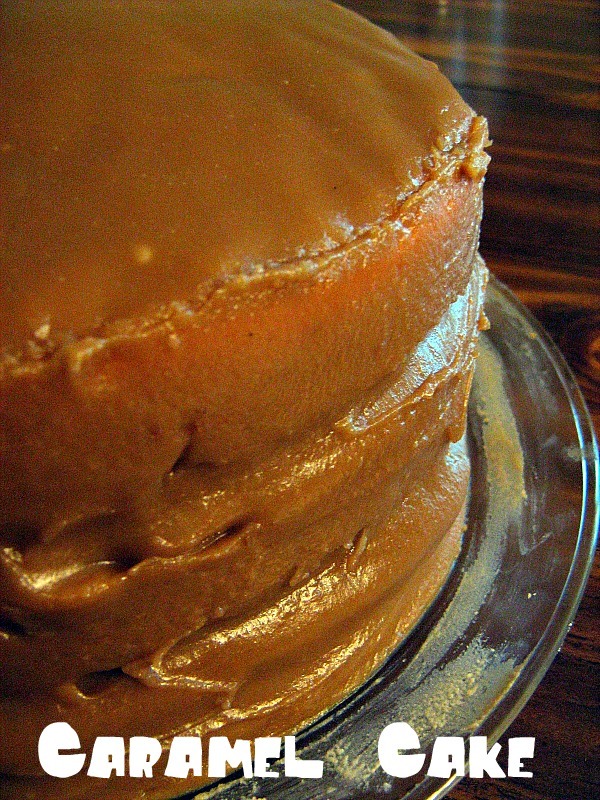 I made a caramel cake, but as you can see from the plate it is on, it was a messy experience, and I wasn't really sure if I was going to share these recipes or not, so I didn't get a great picture of it. Fun frosting. Very fun. (I have an alternate caramel frosting recipe linked up below if the original one scares you). 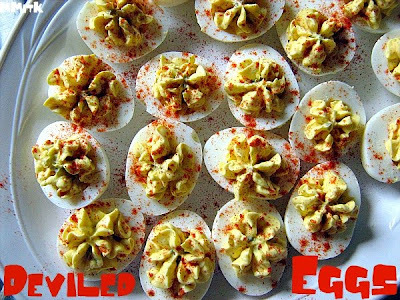 And of course, deviled eggs. 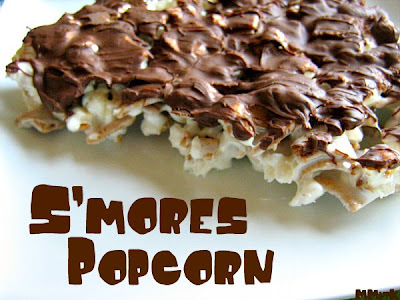 The other day, I thought that S'mores Popcorn sounded like a fun treat and of course, if I thought of it, that definitely means someone else out there has thought of it too. 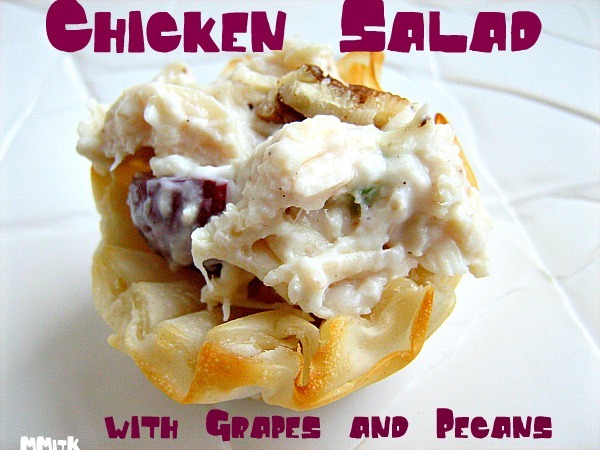 I googled the idea and found a recipe/idea that I wanted to try. I decided to pop my own popcorn on the stove (because that is what I do these days) and buy a box of Golden Grahams, so that we could try this yummy treat. I decided to make ours kinda like Rice Krispy Treats, but with popcorn instead of rice krispies. I melted the marshmallows with a tiny bit of butter and then mixed in the popcorn and Golden Grahams. I spread that mixture out on a cookie sheet sprayed with cooking spray and then spread melted chocolate on top. The result was a very interesting, chewy, chocolate-y, popcorn treat. Fun for kids and adults! I saw these cute little Baby Bok Choy's at Trader Joes a couple of weeks ago and remembered a fun recipe I had seen recently, so I bought these little guys immediately. I have an indoor grill that I can use anytime of year and that is what I used to grill these. They only take a few minutes on each side to become nice and tender and then you drizzle a delicious vinaigrette over top. My kids decided this was a dish that did not require silverware and happily ate these with their fingers. 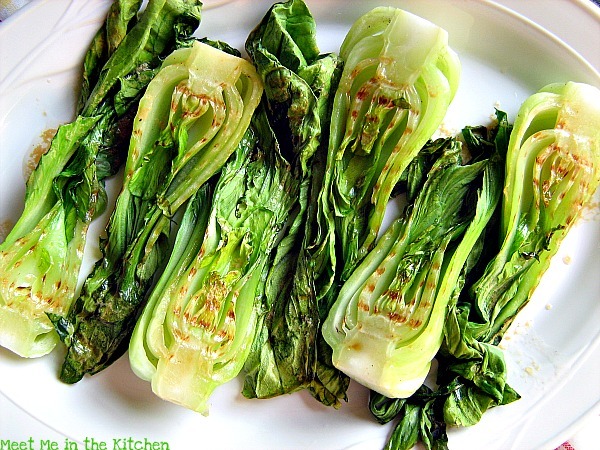 If you spot Baby Bok Choy at a local farmers market or grocery store, buy them and give this recipe a try! I'm late! I'm late! Better late than never though, so I present to you the Fig Swirl Coffee Cake that I made for this month's Cooking Light Virtual Supper Club. Jamie was our host this month and she chose the theme Breakfast for Dinner. We were able to choose any breakfast food from Cooking Light and here is what everyone came up with. Val decided on Blueberry and Maple-Pecan Granola Parfaits. I have had my eye on this Fig-Swirl Coffeecake for quite some time and decided that this was the perfect opportunity to make this beautiful creation. A yeast dough is filled with a fig/orange juice combination and then it is rolled up and cut and carefully placed in a beautiful shape. It is a delightful combination. Because it is a yeast dough, it does have to rest and rise a couple of times, so be sure to plan that time in if you want to serve this for breakfast. 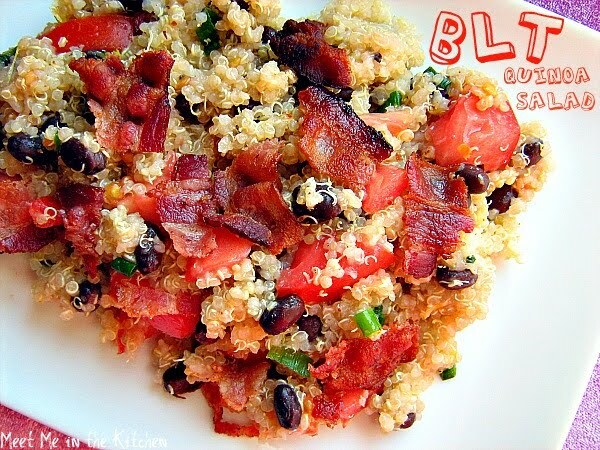 Make sure you check out all the delicious recipes that were made for this Breakfast for Dinner! A couple of weeks ago, my kids helped me make a variation of these Mini Chicken Pot Pies. I don't think they have ever really had chicken pot pie or any kind of pot pie that they could remember, so it got them interested in the whole idea of a pot pie. When I was asking my family members for suggestions for the weekly menu, someone of course wanted pizza, so I found this recipe and thought it would be a fun twist. The sauce starts out with some pancetta and fresh rosemary and the filling contains cubes of mozzarella cheese, chicken, and broccoli. It was fun for us to eat these for dinner because everyone had their own individual little ramekin to enjoy. The one pictured above was the one that we made for Dad, so it was bigger than the others. I first made this salad a few years ago and it was an absolute hit. I made it for my family, made it for potluck dinners, made it for company, and shared the recipe with friends. It takes everything that is delicious about a cheeseburger and makes it even more delicious. 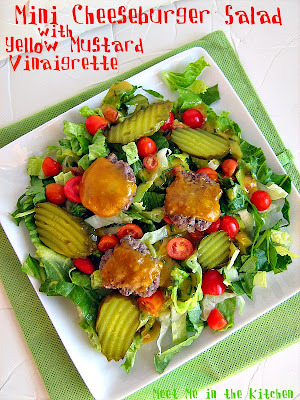 You make little burgers, along with a delicious mustard vinaigrette and they are layered on a bed of romaine, cherry tomatoes (I still have some growing in my garden! ), and sliced dill pickles. My whole family loves this one, even me.